You don't have to have a smoker or a grill to make these tender, flavorful spareribs. The oven bakes them slowly to tender, succulent perfection. The ribs are brushed with an easy homemade spicy barbecue sauce the last 45 minutes of baking time. Although cooked indoors, these ribs are perfect for a summer barbecue as you can make them ahead of time—and leave plenty of room on your grill for the rest of your cookout fare. Serve these flavorful juicy ribs with mashed potatoes for a weeknight meal or a potato salad for a casual dinner on the deck. In a small saucepan, heat the butter with the vinegar, water, brown sugar, garlic powder, onion powder, and black and cayenne peppers. Cook, stirring until butter has melted. Remove from the heat, let cool a bit, and then cover the sauce and refrigerate until it's time to baste the ribs. Remove the silver skin from the back of the ribs. Use a kitchen towel or paper towel to grasp the edge of the skin and then pull. It should pull off in one piece. Cut the pork ribs into serving size pieces of one, two, or three ribs each. Place the spareribs on a rack in a roasting pan, meaty-side up. Roast uncovered for about 1 1/2 hours. Brush with the sauce and continue roasting for about 45 minutes to 1 hour, turning and brushing with the sauce several times, until ribs are cooked through. If you prefer your ribs to have a grilled flavor, bake them until they're nearly done and then grill them for about 15 to 20 minutes, or until charred. Or, for really saucy ribs, place the ribs in a roasting pan and cover with the sauce mixture. Refrigerate for 1 to 2 hours. Cover the pan and then roast for 1 1/2 hours. Uncover and continue roasting for 45 minutes to 1 hour, occasionally basting with the liquids in the pan. If you like a more traditional tomato-based barbecue sauce, glaze them with a store-bought or a spicy barbecue sauce about 15 minutes before they're done. By changing the type of barbecue sauce—from smokey to sweet—you will completely change the taste of these ribs. 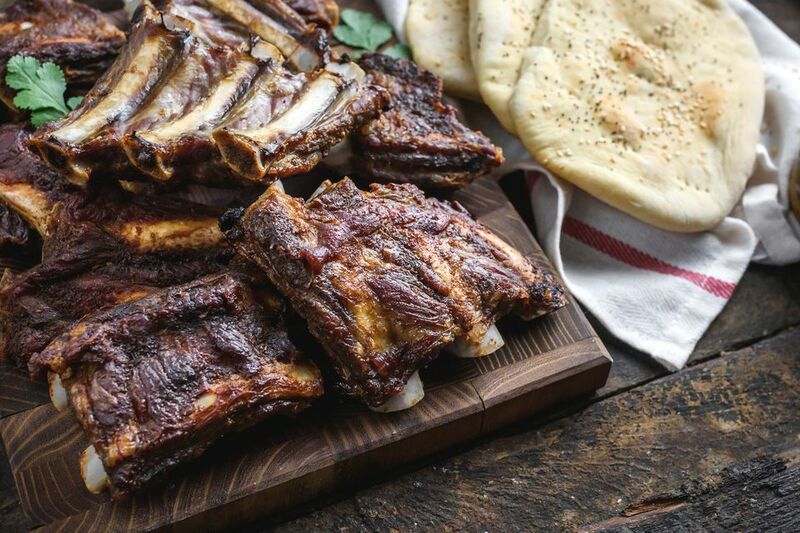 If you prefer beef ribs over pork ribs, make sure to use beef back ribs and not short ribs; beef back ribs cook similarly to pork ribs whereas short ribs will dry out with this cooking method.